In partnership with American Express, Fortune searched the U.S. for outstanding female business builders. 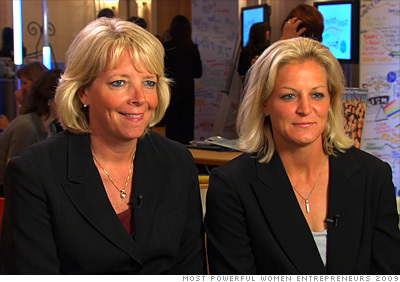 Fortune honored these game-changers at its recent Most Powerful Women Summit. From Lauren Bush to environmental innovators, here are the winners. Walvius (left) quit her longtime job as head women's basketball coach at the University of South Carolina to launch Sheex. Marciniak was assistant coach. When they were coaching women's basketball at the University of South Carolina, Walvius and Marciniak came up with the idea to apply performance-fabric technology -- the technology that wicks moisture in Nike athletic apparel -- to bedsheets. Crazy? Not so. Walvius and Marciniak got R&D help from the university's business school and raised $1 million for their "performance bedding" start-up. In May of last year, they quit their coaching jobs. They lined up manufacturing in California soon after, and launched Sheex.com this past April. This month, they cut a deal to sell in the NBA's flagship store in Manhattan. Their marketing strategy is grassroots and viral, with Twitter and Facebook promos by pro athletes like the New York Giants' Steve Smith and the LPGA's Christina Kim. Being hard-charging athletes themselves, Walvius and Marciniak are naturally inclined to race for a win. But the best advice they got? "Crawl, walk and then run," says Walvius. In business, as in coaching, she adds, "You're either getting better or you're getting worse with each day. There's no such thing as staying the same." --P.S.